How often do you want to give up blogging especially the passion is fading away? Do you feel it’s painful when you have to write a lengthy and compelling article after day job? How many times you just want to relax after a nice dinner? There is an enormous amount of seo blogs being created every single day, but how many bloggers can keep working their bums off on writing useful content for a long time? Only a few of them. I am sure you want to be next Darren Rowse or any other succesful bloggers, but the first thing you have to do is KEEP WORKING, just like gym workout. Have you been to gym often? If so, you will know blogging and gym workout have 5 things in common. Everyone is slim once just starts doing workout in gym, do not expect to be strong in few weeks, but you will eventually be really strong after spending great effort in a long period of time. Same principle applies to blogging, stop dreaming there will be a large amount of readers instantly and start thinking about your next blog entry. John Chow spent 5 years on blogging before he monetised his blog, and Darren Rowse built his blogging career slowly from a hobby, to a part-time job, finally to a full-time business. 3. You need to learn and get help. I am sure you felt lost once you’ve been to gym for the first time. All kinds of different bodybuilding equipment, yoga balls, running machines…etc. You have no clue where to start exercising, hence coach is extremely important for the starters, coach teaches you how to train different muscles, help you write workout plan and tell you how to avoid injury. You also need supplements for building your body up, such as whey protein, it is important for your muscle recovery. Similar to blogging, first time blogger is fighting alone, lack of blogging skills, don’t know how to make content viral and how to lure readers to the blog. Therefore learning is a must, while you are working on blog, you have to learn, from successful blogs, from know-how e-books and even from you own mistake. Reading other blogs can be great supplements to enhance your writing skills, technical know-how, tracking and measuring and any other blogging skills. Injury is a very common thing in gym, it can happen anywhere anytime if you are not careful. Of couse the best case scenario would be to avoid injury, but it’s nearly impossible, many people decide to quit completely after a serious injury, I am not saying they are not right, but it means you will not be in the gym ever again. Remember Michael Jordan? He had injured severely in his sophomore year, many fans thought he would not be able to come back (though they wanted him back desperately). But Michael Jordan eventually came back after done a really hard work on recovering for nearly one year. For blogging, injury can be different, reputation damaged, subscription lost after changed emailing service, or even data lost on the server (if cannot be recovered)..etc. You have to face the injury positively, it’s not end of the world, you always have chance to be recovered. If you decide to quit, then you cannot make any impact in the blogosphere any more. 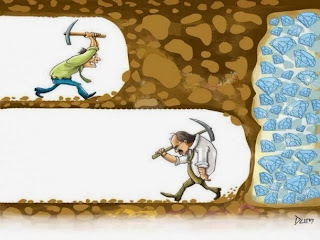 Never ever give up! Blogging is pretty the same, everybody wants to be as big as Darren Rowse or Jeremy Schoemaker, so some people start replicating the way that DR and JS goes to success. Did they succeed? Not really. All of the successful bloggers have few things in common, and these things cannot be replicated so easily. - Early bird, they got involved in blogging industry when you have not even heard about this word. - They worked their butts off to succeed, they started them from hobby, but monetised them only when they treated it as serious as a business. - They are really passionate, not only about earning cash, but also about doing the business. You never saw them not posting in any day right? - Secret weapons. Why everyone listens to them? Why their contents are so viral that people have to link to them? Why they have better conversion rate on their affiliate links? What other income streams do they have? There is much bigger secret lists they have, some of them are revealed and rest of them are not. While you are learning from them, always thinking too. Have you found your passion back again? Blogging is not a easy job, same as workout, you will taste the success only after serious dedication to it. No Pain No Gain! English is not my first language, so I guess I feel more painful than you do, am I right? So if you don’t really have any excuse not writing a blog entry today, do it NOW or you will never be able to make it. What’s your experience on blogging? Have you decided to give it up? How did you convince yourself to come back? I would love to hear your story, please leave it as comment, thanks.